Observe the image above. Now tell me, which is further away. The sheep that is 30 yards away on level ground, or the sheep which is 30 yards away on a downhill slope. If you said they were both the same distance, you would technically be correct. 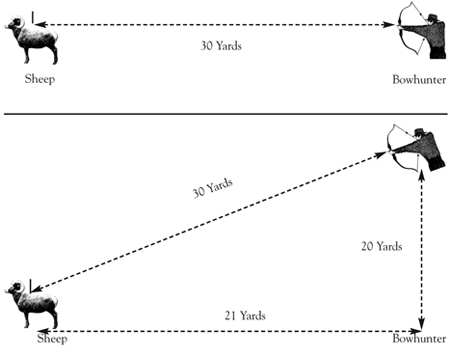 But when it comes to archery - and in this case gravity - the sheep on the downward slope is really only 21 yards away. Thus a person using a compound bow in the above example should be using the 20 yard pin, not the 30 yard pin, and aiming just barely below the 20 yard pin so it is closer to 21 yards. This represents a common mistake when it comes to archery / bowhunting. People assume that because the target is a certain distance away in a straight line that they should aim according to that distance. But what they don't understand is that gravity only affects the arrow for the distance horizontally that the arrow spends in the air. Thus when shooting at a target on a downhill slope all you really need to do is calculate the horizontal distance to the target. With experience, archers can learn to figure out this and calculate their shot accordingly, but if you didn't know this then you would end up having the shot go too high and end up missing the target entirely because you were aiming too high. There is also a 2nd problem. Gravity Assist Acceleration. Logic and science dictates that gravity would actually help the arrow on a downward shot go faster. Yes, this is technically true, but the difference is so negligible at short distances that it doesn't really effect the accuracy. At much longer distances then it would matter, but at the distances that people typically hunt at it does not really matter. Form Wise - On a downhill shot you want to lean into the shot so you can align your shoulders correctly. Trying to stand up straight with your arm on too much of a downward angle will cause your bow shoulder to tense up. By leaning forward (like you would when bowfishing) you allow your bow shoulder to become relaxed and align yourself properly. Practicing downhill shooting form is definitely recommended if you plan to be shooting that way regularly. A good way to do this would be to get into bowfishing. "The Arrow is Always Arcing." With an upward shot we encounter the same problem, with a slight twist. Again the sheep is really only 10 yards away in the image shown on the right, but it looks so much further away and the height be confusing. Instead look horizontally to an object that is directly below your target and calculate your distance to that. Then aim accordingly. Gravity Deceleration will again effect your arrow (like it always does), but no more than any regular horizontal shot at a short distance. The difference will be so negligible that it will be barely noticeable. Form Wise - If the target is only a little bit higher than yourself, then your form doesn't really need to be changed at all. 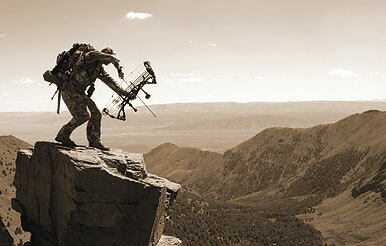 However on a really high angle (like in the case of bowhunting for birds) you will have to deliberately lean backwards... the trick however is to only lean enough that it allows a more comfortable and accurate shot, but without causing you to tense up your shoulder. Getting into bird-hunting is one way to get good at the really high angles. 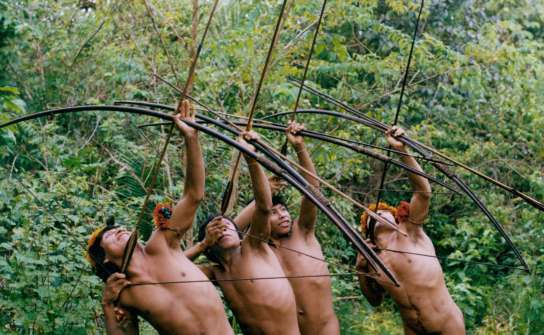 Below: Bird hunters in the Venezuelan Amazon prepare for a shot. They use very long arrows so that if they miss the arrow is easy to find.